Paul Ryan's State Of The Union Rebuttal: The Best They Got? Paul Ryan delivered a heck of a rebuttal tonight, especially if you wanted to make one of those "Sarah Palin breathing" videos. 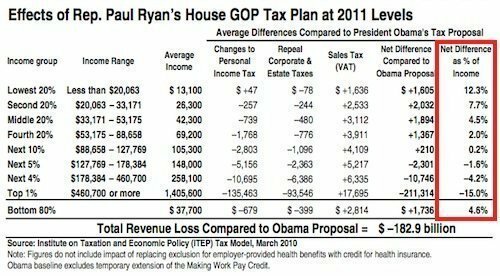 But as far as the facts -- on taxes, stimulus, and health care reform -- go, a lot of Ryan's rebuttal came rebutted-back in advance of its delivery. The CBO score that people are relying on to reach that conclusion doesn't actually estimate how much revenue Ryan would raise, instead it just takes Ryan's word for it that his ideas would raise 19 percent of GDP. That's because the CBO doesn't score tax issues, that's done by the Joint Committee on Taxation. But if you look at what Ryan's ideas would actually do, the truth is rather different. As often as Ryan despairs over the high burden taxpayers face, it often goes unsaid that Ryan's own tax plan is an idiot exacta: It slashes government revenues while simultaneously raising taxes on 90 percent of taxpayers. 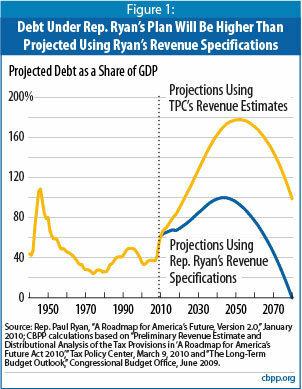 Ryan and the "Failed Stimulus"
Ryan has declared the 2009 stimulus package to be a failure. This does not appear to comport to factual reality. Just look at the outside evaluations of the stimulus. Perhaps the best-known economic research firms are IHS Global Insight, Macroeconomic Advisers and Moody's Economy.com. They all estimate that the bill has added 1.6 million to 1.8 million jobs so far and that its ultimate impact will be roughly 2.5 million jobs. The Congressional Budget Office, an independent agency, considers these estimates to be conservative. What we already know about the President's health care law is this: Costs are going up, premiums are rising, and millions of people will lose the coverage they currently have. Job creation is being stifled by all of its taxes, penalties, mandates and fees. Businesses and unions from around the country are asking the Obama Administration for waivers from the mandates. Washington should not be in the business of picking winners and losers. The President mentioned the need for regulatory reform to ease the burden on American businesses. We agree - and we think his health care law would be a great place to start. Last week, House Republicans voted for a full repeal of this law, as we pledged to do, and we will work to replace it with fiscally responsible, patient-centered reforms that actually reduce costs and expand coverage. The actual impacts of the bill are more complicated. Overall, the report that the president cited found that, for most Americans, the Senate bill would keep their insurance premiums roughly the same. Employees of small firms would effectively see their insurance premiums unchanged, while workers at large firms would see something between unchanged and slightly lower premiums under the bill, according to the analysis, which was released in late November. More than half of people buying their own coverage would qualify for the new insurance tax credits, available to families of four earning up to $88,000 a year. 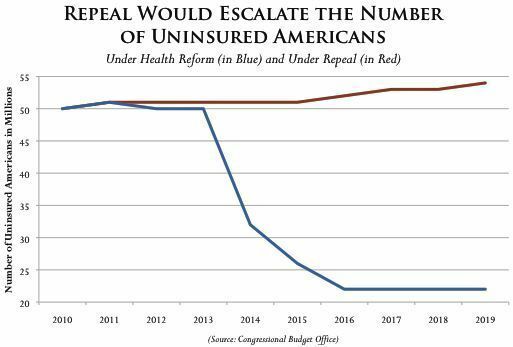 Those credits would significantly lower their health-insurance costs, leaving them paying 56% to 59% less than if no bill were passed. The wrinkle in whether this would actually increase premiums is that consumers buying policies on their own with a new insurance exchange would be required to buy plans that, on average, are more generous than the ones they currently have. Because of that, they would pay higher premiums, the report found. So overall, the bills would mean that more consumers would pay less for their insurance. Dealing with persistent unemployment is one of the top priorities of President Barack Obama and the leaders of Congress. One important way to create jobs is to slow the growth of medical spending. If health care cost increases slow down, then businesses will find it more profitable to expand employment, and workers will more readily move into those new jobs. ... In the analysis that follows, we combine these two studies to show that health care reform could increase the number of jobs in the United States by about 250,000 to 400,000 per year over the coming decade. As a result of changes in direct spending and revenues, CBO expects that enacting H.R. 2 would probably increase federal budget deficits over the 2012-2019 period by a total of roughly $145 billion (on the basis of the original estimate), plus or minus the effects of technical and economic changes that CBO and JCT will include in the forthcoming estimate. Adding two more years (through 2021) brings the projected increase in deficits to something in the vicinity of $230 billion, plus or minus the effects of technical and economic changes.